Discussion in 'Political Opinions & Beliefs' started by OldManOnFire, Mar 22, 2018. Sandy Shanks, Lee Atwater, MissingMayor and 2 others like this. It's past time. I hope Mueller can get something going before April 9th. If Bolton takes over we'll be at war with North Korea. Bluebird, Lesh, PT78 and 1 other person like this. It's about time. President Clinton should've destroyed the North Korean regime in the early 1990s instead of letting that fool Carter get in the way. Lucifer, Bluebird, Bowerbird and 1 other person like this. It certainly makes it much more likely. I understand he may not replace his Chief of Staff when he fires Kelly soon. I don't agree with Kelly on most everything, but at least he was reasonably level headed. Something Bolton isn't. But while he may not be level headed he's a pretty damn smart (we know this because he doesn't tell us so) war hawk. One that knows how to lead a man who receives his daily briefing from watching a one sided view of the news. Lucifer, btthegreat, Bowerbird and 1 other person like this. I wrote McCain and Flake and simply said: For god's sake get that village idiot out of there. Bluebird, Bowerbird and PT78 like this. u gonna enlist or just laugh as people die? Lucifer and Bowerbird like this. Neither. Far too old to enlist anyway as you well know. It might be too late. Trump is replacing every cabinet member with a spine. The new appointees will never vote him out I am afraid. Would be nice if the Republicans would at least allow a vote for censure for any one of the dozen things he has done that is completely inappropriate for the office. Good luck with that prior to any evidence from Mueller. Actually, Clinton had the beginnings of a possible solution with N. Korea worked out (the Agreed Framework) but Dubya blew it up after he was appointed prez by the Supreme Court. OldGuy?wise, Bluebird and Bowerbird like this. Chester_Murphy and Sanskrit like this. He had crap and the only thing Bush did was figure out we were being played...Given Carter that was a forgone conclusion. Disappointed hillary voters want the corrupt swamp rats in washington to mount a bloodless coup against trump? So Bolton is in charge now? You guys change your story so often its hard to keep up. Chester_Murphy, JakeJ, RodB and 1 other person like this. So when Americans get old and sick they have no right to have their opinion heard about when and where our military fights? Talk about undemocratic beliefs on your part. Chester_Murphy, JakeJ and Sanskrit like this. 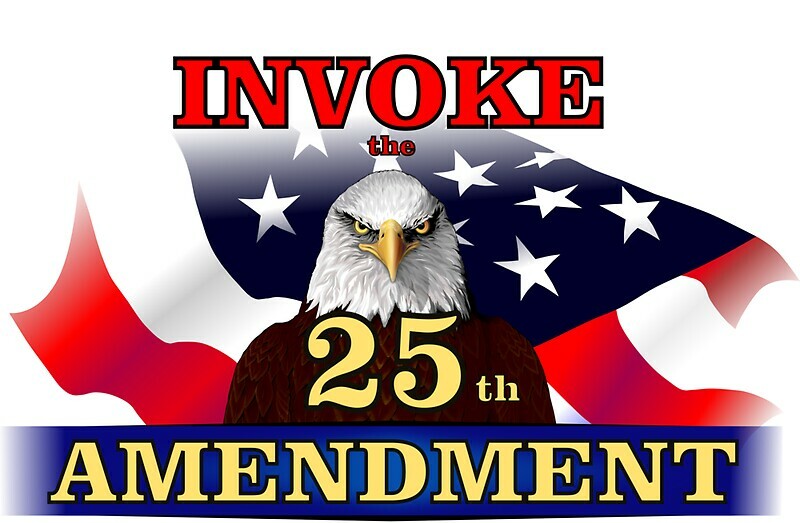 It sure looks like we "need" to invoke the 25th ( i mean we may end up in a war...possibly my mistake). Go play in your sand box. This is grown up talk. It requires a 2/3 vote from both Houses just like impeachment. In addition, you need to get the VPOTUS and majority of the Cabinet to agree. It is faster than impeachment, but probably harder to achieve, unless the President is much more loony than Trump. I guess you want Mike Pence for President. I, for one, will be happy. I wouldn't support a 25th Amendment implementation unless President Trump starts summoning the military officer who carries the "nuclear football" and starts looking at targeting options. How is it you show incompetance? A president doing things you don't like? Seems like a low low lower convenient bar. That may well happen and rather soon. You actually want to start a war with North Korea? Within days Seoul will be a cemetery. If things look bad for Sum Fat Kim...he'll launch a nuke or three at Japan and possibly the US Mainland. if we attack North Korea in the absense of an attack from them or an impending attack, China will defend North Korea. frankly I hope China tells Trump that if the USA attacks NK without a prior attack by NK or a clearly impending attack by NK, China will attack South Korea, Tokyo and Hawaii.